The Coopered Tot: Black Bush is a step up but still falls short. Bushmills and Jamesons are the leading brands of Irish whiskey. The white labelled "Old Bushmills" as the entry level product has a high proportion of neutral grain spirits which give an insipid weak and fishy quality which mar the lovely minty clean Irish whiskey flavor. 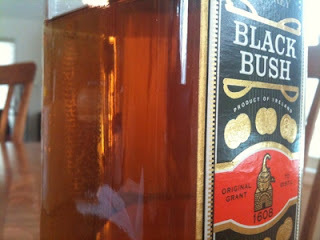 Black Bush is still a blend, but ups the proportion of malt whiskey substantially to the benefit of the flavor and enjoyment. Clean and minty - the malt in Irish whisky is baked in sealed kilns, rather than over peat fires like Scotch so, unlike Scotch, Irish generally has no smoke and no peat. This arrangement allowed the use of sooty coal fires for malting without affecting the flavor of the malt. This cleanness of malt flavor is amped up by the use of triple distillation which removes most of the heavy volitiles. This is changing, particularly as regards Cooley's Connemara line which makes peated Irish using double distillation. Black Bush, however is an old traditional style. The "Johnny Walker Black" of Irish whiskey in almost every detail. Color: a rich old gold with amber tint. Caramel color? I'd bet there's some. In any case it is a darker, prettier dram than the white by far. Nose: Not a big nose, but polite, sweet, delicate and amiable with minty malt, green pear, and some toffee malty sweetness subtly underneath. Entry is sweet and clean with refined white malt sugar and gentle spearmint. The mint note expands and becomes peppery - merging with spirit heat at mid-palate. The malty grain emerges and gives a bit of body before becoming a bit beany and rough at the finish. The finish is short with a bit of bitterness at the end. This bitter finish almost has a toasted oat, woody quality - but not quite. I find it ends up more neutral bitter, almost like a chemical. 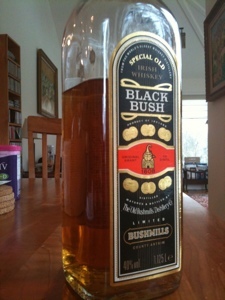 Black Bush is light and easy drinking, but isn't distinguished or memorable in any way. It's a clear step up from white label Bushmills - but not enough to recommend. The front end really does show you malt flavor. It's nice in coffee, or for other Irish mixing duty. It's ok to sip neat. However, it's too dilute at 40% to add any water to (to help smooth the bitter note). Bottom line - an ok option if you want a nice middle of the road Irish minty flavor option but there are far better Irish whiskeys out there for not much more money such as Tyrconnel, Redbreast 12, The Knot 100, Kellan, or even Jameson 12 (not the undated expression). Even Tullamore Dew 10 (not the undated expression) is a step up in my opinion. Meanwhile, I consider Bushmills 16, Bushmills 1608, and Bushmills 21 among the finest Irish whiskeys (just a notch below Midleton's Very Rare) - so it's not as if the distillery doesn't know what they are doing. i import a miniature (31019712.) perfect. that growing heat that rises and so dam pleasant. soft chewy cereal bits. vanilla rose flavors. i buy a local blackbush(31019705)and its strong .bitter bite. heat like rubbing alcohol. not light up in the mouth. smell is fine.it just don't hold together like in the 50ml. backbush has a few commits like this on net that why i put it off for so long. i am after a Irish Whiskey with grain that includes corn. and yes not bitter and rubbing alcohol. Interesting notion that the miniatures are better. As for an Irish whiskey made with corn - I've never heard of such a thing. Corn is pretty much the exclusive domain of American Bourbon and corn whiskey. I don't know of any European whiskies made with corn. Do you? oh i meant maybe matching number up regardless of size indicates batch. so this could advoid getting a biter, less fresh off one. i wish i knew more. blackbush uses 20% corn there grain mash. the rest is the malt/unmalted barley. Apparently all there products are gluten free. i never knew. Wow, you're right. The grain whisky portion of Black Bush is made from wheat and corn according to the Bushmills FAQ page. Thanks so much for setting me straight.